David Peralta, husband of an owner of the Antelope Valley Diamond Collective in Rosamond, said he paid Kern County Planning and Natural Resources Director Lorelei Oviatt $70,000 in cash to clear the way for the medical marijuana dispensary to operate. The allegations are included in a lawsuit filed in January by the group Citizens Against Corruption, a loose collection of Kern County medical marijuana dispensaries which is organized by former dispensary owner David Abbasi. In the lawsuit, the group claims that county officials violated due process laws through an uneven enforcement of the county’s ban on marijuana sales. Abraham Labbad, attorney for Citizens Against Corruption, has said the group is asking for $60 million in damages. The lawsuit also seeks to prevent the county from enforcing an ordinance that would shut down all medicinal marijuana dispensaries by the end of May while the case proceeds through court. A federal judge in March had dismissed that request but attorneys for the group filed an amended request last week to prevent the ordinance from taking affect. In the court filings, and at a press conference held by the group on Monday, Peralta said he believed some of the alleged bribe money paid to Oviatt was being forwarded to Supervisor Mike Maggard. Peralta could not provide any physical evidence of the exchange, which he said took place in Lancaster. "The first thing (Oviatt) said was come by yourself and no cell phones with you," he said, recalling an alleged conversation with Oviatt. He said one other person witnessed the exchange, but that person was not available for comment on Monday. Both Maggard and Oviatt denied the charge, and the county is seeking to dismiss the lawsuit, which was filed in U.S. District Court. Maggard, too, fervently denied receiving payments. “I have never taken, or even been offered a bribe,” he said in an email. 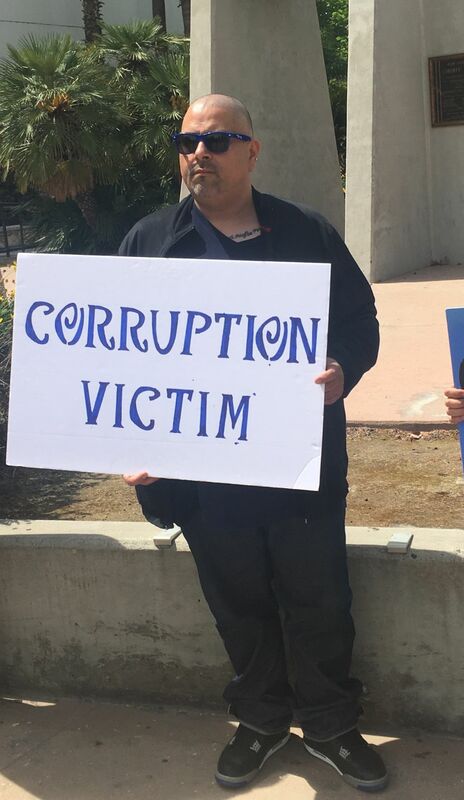 He said he was a junior member of the Board of Supervisors at the time of the alleged bribe. In the lawsuit, Peralta implies that the payments would go to a group of people, including Maggard and the “head chair” of the Board of Supervisors. At that time, the board was chaired by Ray Watson, and the other members were Jon McQuiston, Don Maben, Michael Rubio and Maggard. Maggard said the latest allegations were a smear campaign. “I will not allow the delusions of David Peralta, an alleged felon and gang banger according to The Bakersfield Californian (to) stop me from protecting the health and safety of my constituents,” he wrote. In 2013, Peralta pleaded guilty to recklessly discharging a firearm and spent several months in custody, according to Kern County Superior Court. The next year, he pleaded guilty to possession of a firearm by a felon and of possessing ammunition by a person prohibited from owning a firearm, according to the court. Around 30 people attended the press conference on Monday to protest the county's treatment of cannabis dispensaries and hold a rally. In addition to filing to dismiss the case, the county has also sought to strike portions of the suit, according to Kern County Counsel Margo Raison. Raison said a judge is scheduled to hear the motions on April 15. The proof is out there. Text messages from Perez's husband showing regulations and permits for sale, the $25,000 bribe that was paid, her admitting the board was influenced by special interest and asking Maggard to also recuse himself from any future votes, emails and text messages show some pretty damning evidence already not to mention Maggard lied about a contribution to received from a dispensary who was added to the list after the contribution and somehow got a state license. Did I mention the proof the planning department was stonewalling people and not letting anyone come up to code but somehow allowing to dispensaries to go through the permit process and obtain state licenses? Oh-yeah-yello there's that too but again mountains of evidence I don't have all day to list. Whether or not that is true the facts remain the same. The IPG real estate group in court docs revealed $25,000 was paid to Supervisor Perez's husband. A dispensary was extorted for $25,000 to buy the men on the Boards votes. And now another dispensary paid 70,000 to be 1 of 6 in a dispensary ordinance Supervisor Maggard proposed on December 5th 2017. Just days after the ban. The former Kern County sheriff's deputies who were disgraced along with Bakersfield police officers sold marijuana seized in dispensary raids on the streets. There is a long history showing that you have to pay bribes or extortion money to get permits or other authorizations for everything from oil to the PACE program as other lawsuits have shown wrongdoing. Looks like dope dealer folks are applying the same techniques they see a certain political group constantly exercising. Make up accusations against the people they have a beef with, provide no hard evidence, and use anonymous witnesses. Can’t get your way so smear good peoples names.